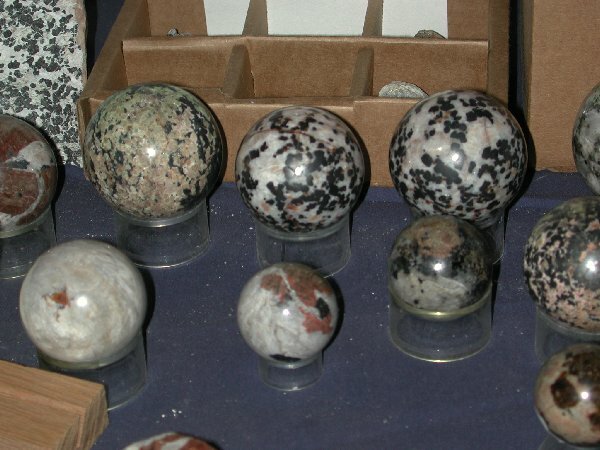 Gems (both rough and cut), Minerals, Fossils, Beads, Jewelry, Lapidary Rock, and equipment and supplies relating to the trade were plentiful once again, especially if you visit the different shows around town. We have included some highlights of this years visit. His location was in a tent along Congress Street. 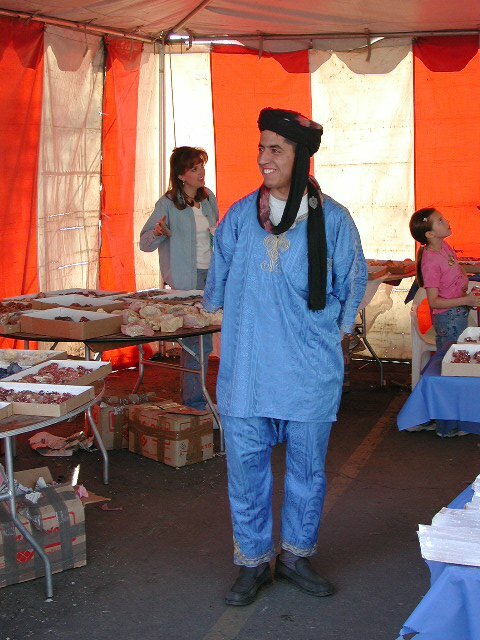 There were a lot of friendly exhibitors from all over the World. If you have encountered or witnessed their generous hospitality, or they went out of their way to accomodate you or someone else, please email Us with your story or comments. 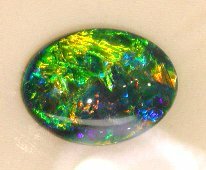 Jack is partial to opals and found some stunning examples at some of the shows. 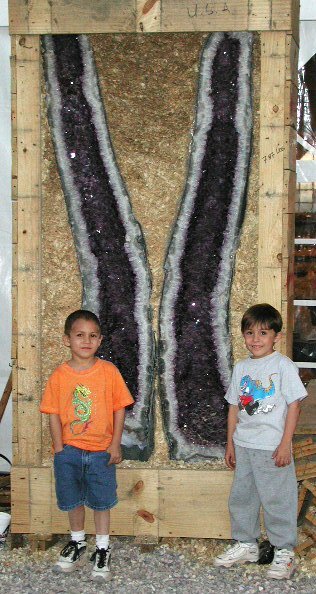 The latter example (at right) is now being used on GemWorld.com's storefront Home page. 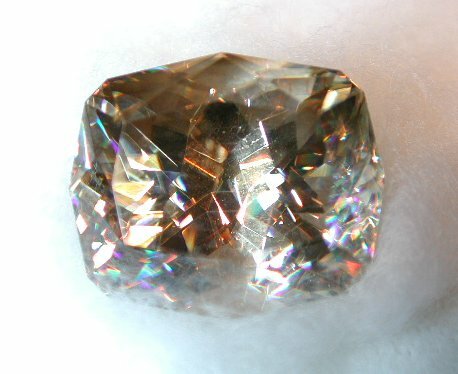 It weights 5.5 carats, worth about $16,000 retail, and was mined by Pual Sedawie's son. Paul and Sally Patel are owner's of "Seda Opals Pty. Ltd." of Lightning Ridge, Australia. The second opal from the left is 18.7 carats and valued at $35,000 retail. 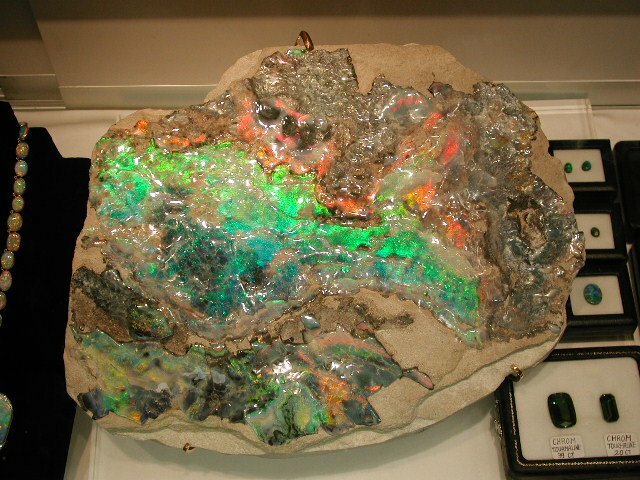 It is owned by PAL OPALS located in Palmview, Queensland, Australia and was displayed at the GJX show. 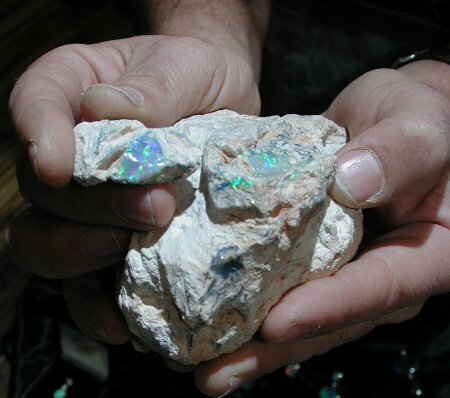 The third stone from the left is a Lightning Ridge opal weighing in at 76.87 carats and valued at $220,000. 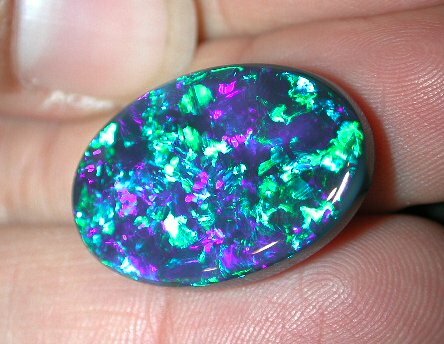 It is owned by OPALUS of Lightning Ridge, Australia. 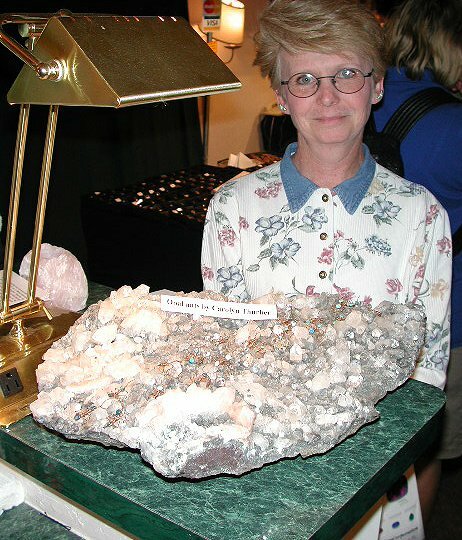 OPAL by TIBARA from Clovis, California have been exhibiting their Opal goods and specimens at the Tucson show for years. They are from Our area near Fresno, California. The name "TIBARA" is the result of combining their names "Tim" and "Barbara." Tim and Barbara also hold seminars in the Las Palmas Room during the show period. Another name they go by is "HOUSE OF TIBARA." They have been in business since 1974. You will find their colorful display advertizement in the TUCSON SHOW GUIDE and in other trade magazines. Their location was in Holiday Inn Holidome. 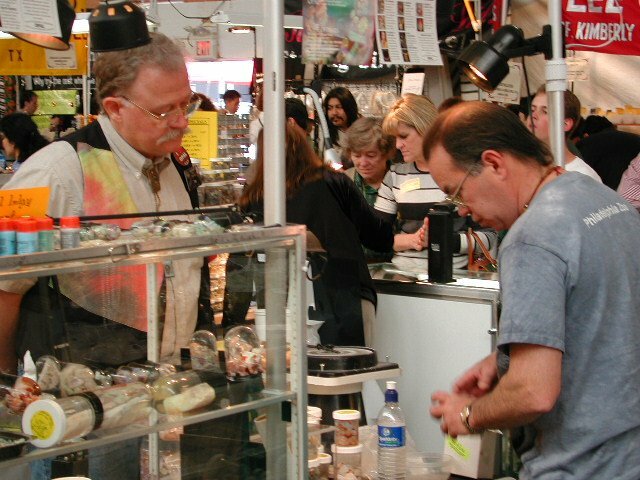 There were many opal dealers at the shows again. 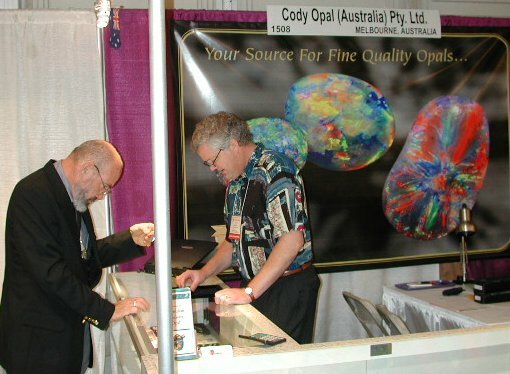 CODY OPAL have been attending the shows for years	and are based in Australia. 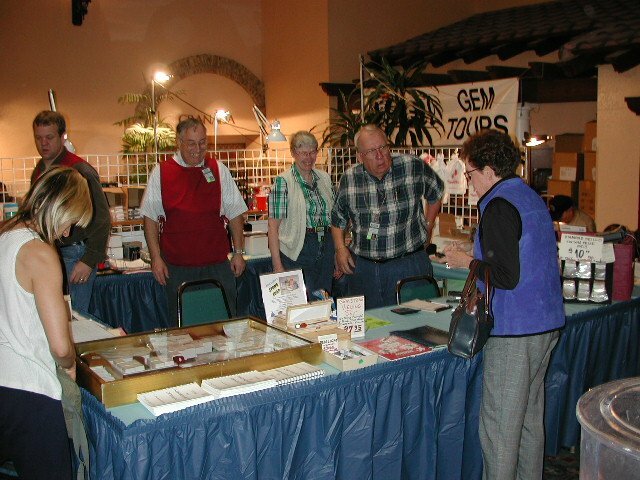 Their show booth location was at the GEM & JEWELRY EXCHANGE SHOW. 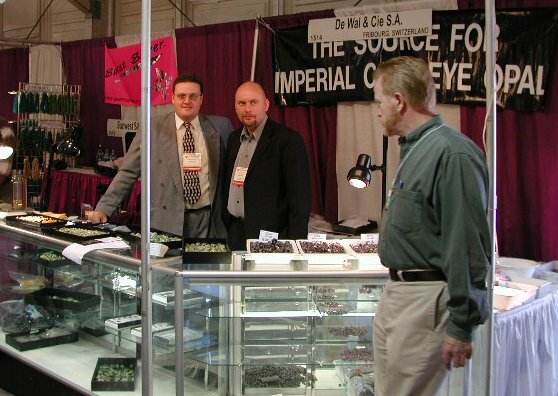 Although We have seen some cat's eye opal at past shows but not as good as the stuff We found at this show or as many. The opals shown here are owned and displayed by "De Wal & Cie S.A." of Switzerland. 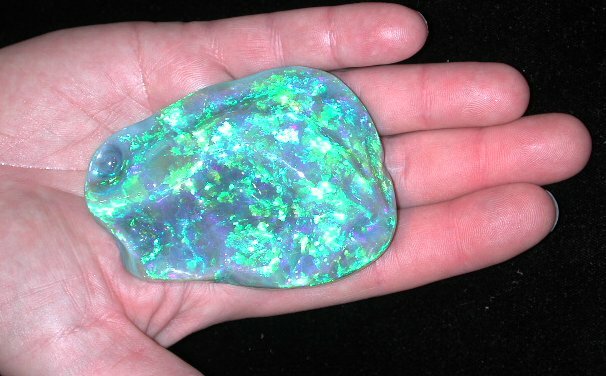 There was some excellent examples of fine rough opal that was proudly shown when asked. 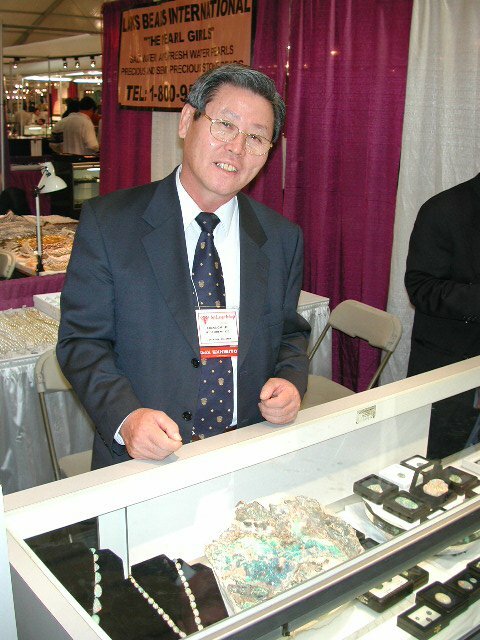 Chung Gap Lee "John Lee" a miner, collector, and vendor has obtained some very nice specimens over a period of time. 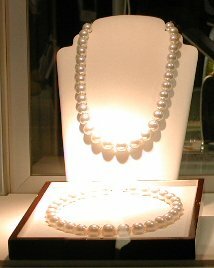 The large opal in center photo was proudly displayed at his booth as well as one of the World's finest neclaces of very large pearls. 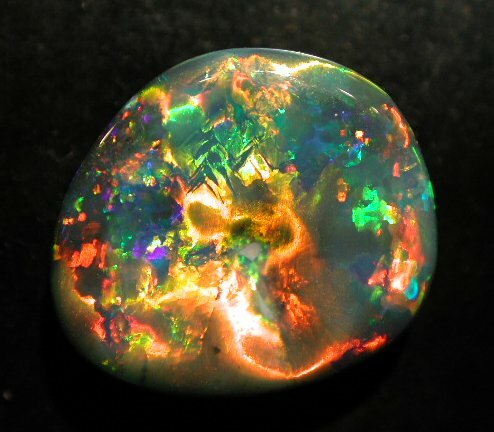 The opal was found 25 feet down at the Mintabe mining area of South Australia and is 150 million years old. John is the Director of their business "Lee's Faith Pty. Ltd." that is located in Sydney, Australia. 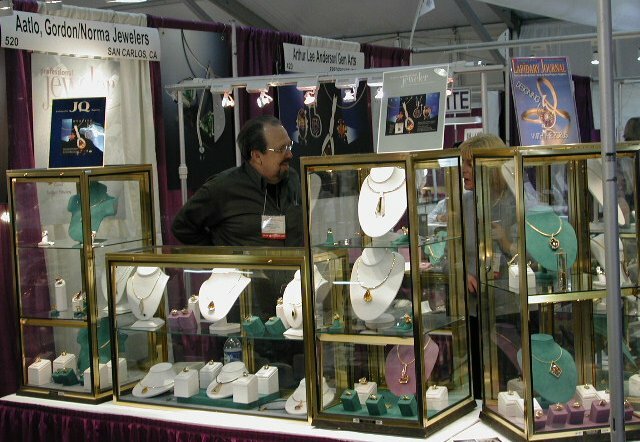 His show booth location was at the GEM & JEWELRY EXCHANGE SHOW. There were a lot of interesting designer jewelry at many different shows around Tucson. 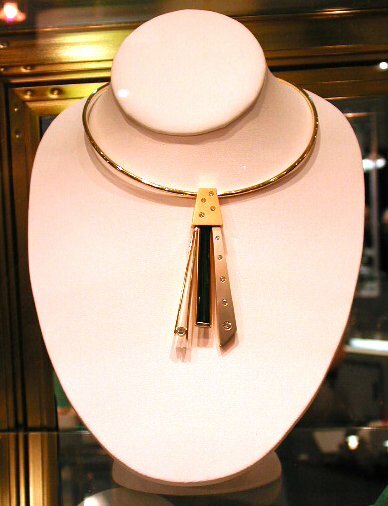 Aalto Jewelers had some exquisite pieces. On February 4, 2001, We met the "Ant Lady" Carolyn Thurber at the INN SUITES. She makes beautiful and interesting ants out of gold wire and opals. The rock display in front of her has her ants in a crawling position over it. Adding the ants to a specimen adds character to the rock. The ants are also available by themselves without specimens so that you can add them to your display. We came across some very large emeralds that were boldly displayed. You can see the museum size of the few in comparison to other emeralds that would be considered large in a setting. 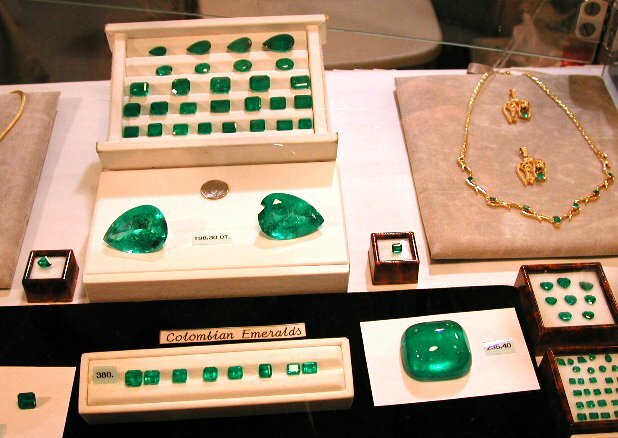 These Columbian emeralds are owned by GERMAN SALAZAR D. The two largest ones in the center of the photos weight in at 198.30 carats and are valued at $237,960 retail. 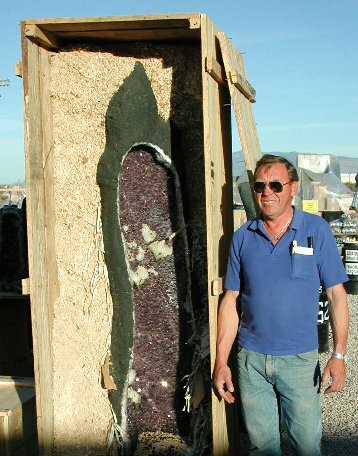 He got started in 1976 by getting to know people in the trade and by buying rough from the Vasquez mine of Columbia. Although he now lives in Germany, he was born in Columbia. 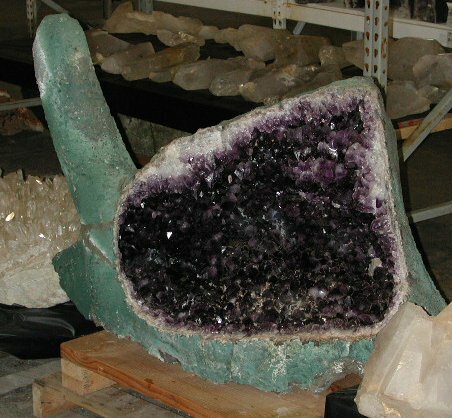 Some very large gemtstones can be seen at the show. 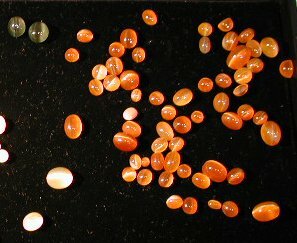 The stone at left is a very large rubelite. 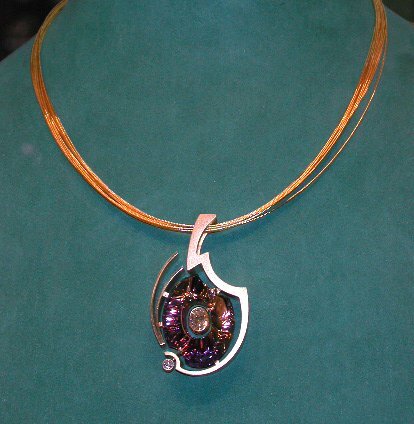 It is 110 carats and valued conservatively at $14,300 retail. The owner of the stone is Abdul S. Gardezy. He got started by attending shows 27 years ago. The stone on the right is a very clean transparent epidote. It is not often that one can find transparent epidote, especially this large. 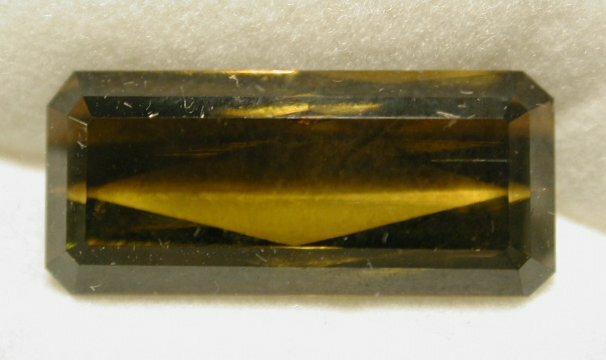 This cut and polished stone from Pakistan weights in at 13.86 carats and is valued at $2100 retail. Not sure what the center stone is, but it was very brilliant with colorful flash eminating from within. It was cut by David Atkinson who owns TERRA a business in Sedona, Arizona. 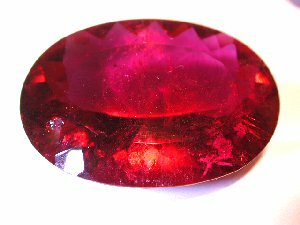 He started cutting gemstones out of necessity because he couldn't find a good gemcutter to cut his rare stones. 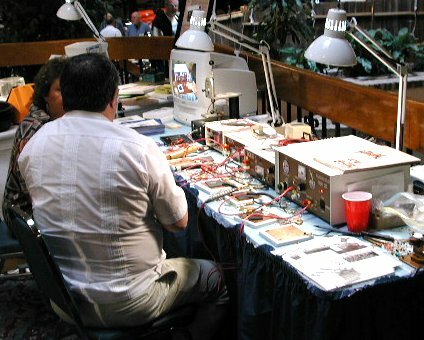 He has been cutting for 20 years now and currently uses a Facetron. 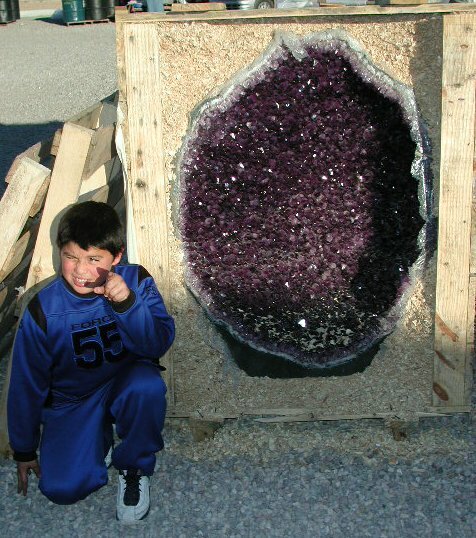 He now has gems in major museums worldwide. 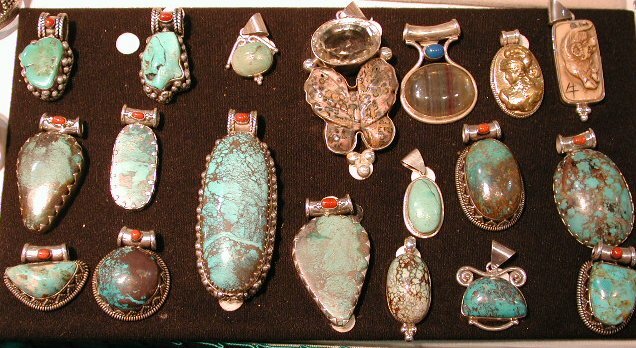 These are stunning examples of large turquoise mined in the united states of America. 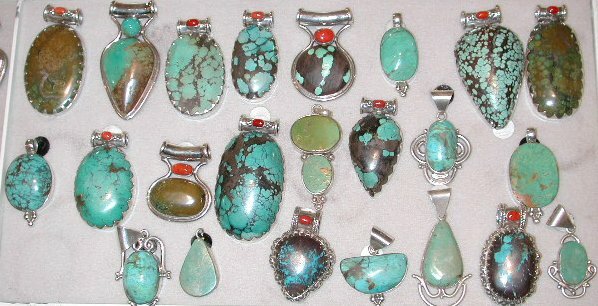 some of the turquoise you see in the photos are as much as 3" to 4" long. 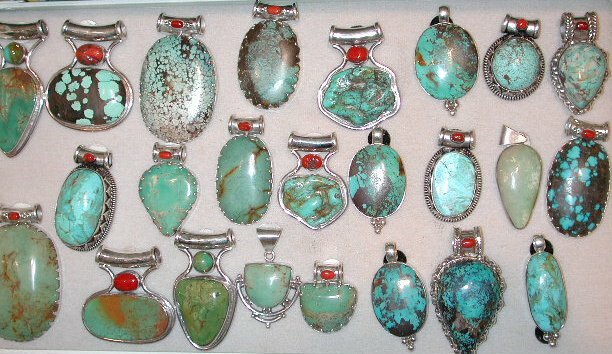 Rough turquoise was shipped over seas to be cut and polished, set in silver settings, and then shipped back to be sold at a fraction of the cost. CONGRESS STREE EXPO behind Electric Park. 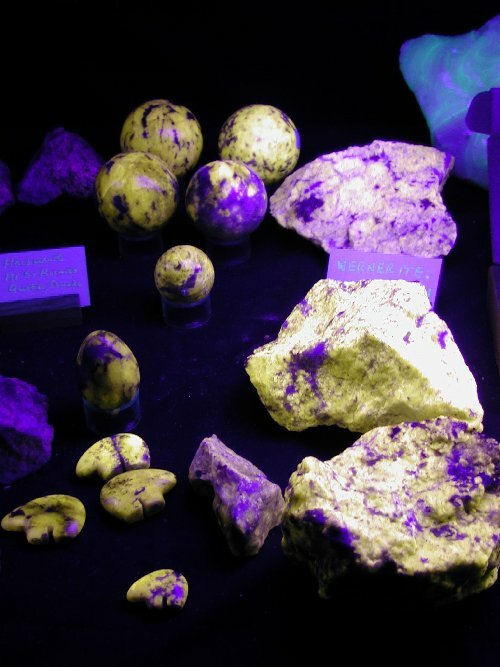 Larger spheres of Fluorescent rocks and minerals are becoming available at these shows. There were also demonstrations of jewelry metal welding machines as shown in left picture. There were testing instruments available (center photo is Dr. Hanaman. 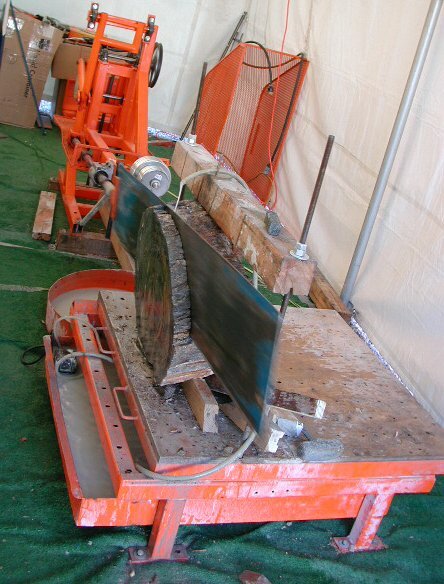 Also We got to see a large lapidary saw in operation (photo at right) cutting a 24" diameter log of petrified wood .